Buck Showalter’s new and improved Orioles left Yankee Stadium with the same old result: a loss. 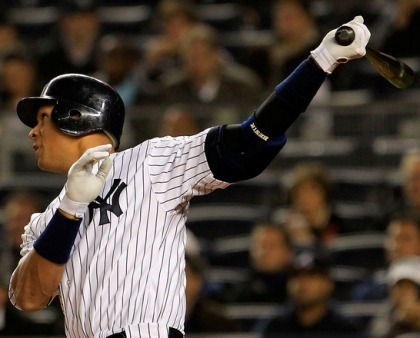 Arod's first inning home run gave the Yankees a lead they never relinquished (Photo: Getty Images). One pattern from past seasons that didn’t hold, however, was the performance of A.J. Burnett. Over the first two innings, the Yankee right hander struggled with his command and mechanics, but managed to pitch around trouble in each frame without surrendering a run. Instead of collapsing in the face of adversity, as had become epidemic in 2010, Burnett rebounded after his rough start to retire 13 of the next 15 hitters before running out of gas in the seventh. Aside from his ability to overcome early setbacks, the most remarkable thing about AJ Burnett’s fast start has been the evolution in his pitching repertoire. According to Burnett, he threw 16 changeups in the game, or 14% of all pitches. Entering the game, Burnett had thrown a changeup 9.7% of the time, indicating that he is slowly gaining confidence in the pitch. For perspective, Burnett has never thrown more than 3.5% changeups in a full season as a Yankee, so if the right hander can continue to develop the pitch, his margin for error should increase. The Yankees entered the game with several key figures in the lineup slumping, but Orioles’ starter Chris Tillman provided an early cure. In 1 2/3 innings, the tall right hander surrendered six runs on nine hits, including a first inning three-run homer to Alex Rodriguez’ and a two run double to Robinson Cano. More importantly, however, the first two innings also featured two base hits by Derek Jeter and Mark Teixeira. For Jeter, the pair of safeties helped move him into a tie with Barry Bonds for 31st place on the all-time list, while Teixeira’s two hits helped break a 0-18 slide that started to reintroduce whispers about the first baseman’s notoriously slow starts. Interestingly, the Yankees early-game outburst was the continuation of a season-long trend that has seen the team pile on runs in the first two innings, but then flounder in the later innings. Including tonight’s win, the Yankees have now scored 27 runs in the first and second innings, or 47% of the team’s total. By comparison, the Yankees have scored only seven runs over the last four innings, which helps explain why the bullpen has played such an important factor in the first 10 games. Speaking of the bullpen, a trio of Yankees relievers was needed to help close out the game when Burnett faltered in the seventh. After surrendering two long homeruns in the frame, the righty was lifted in favor of David Robertson, Rafael Soriano and Mariano Rivera, who combined for 2 2/3 innings of one hit relief. When Rivera closed out the game with an effortless ninth inning, it pushed his save total to five, just one shy of the team’s entire win total. Meanwhile, the victory improved Burnett’s record to 3-0 for the first time in his career. Ironically, Burnett, who was believed to be the rotation’s weak link before the start of the season, now has three of the four wins recorded by starter. Jorge Posada was another struggling Yankee who recorded two hits. His fifth inning homerun broke a 0-19 skid, and his eighth inning single launched him past Phil Rizzuto into 14th place on the all-time Yankees hit list with 1,589. Alex Rodriguez’ three RBIs pushed his career total to 1,839, tying him with Ted Williams for 13th place on the all-time list. As a Yankee, AJ Burnett is 8-0 in the month of April. It’s early. The Orioles are going to see many more losses like this one. Despite recent struggles, I really think it’s going to, once again, be an ALE struggle between the Yanks and Sox.